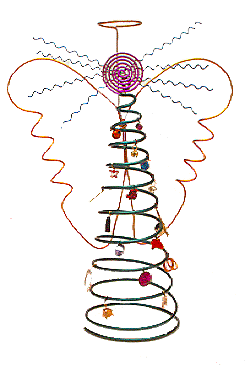 Our Trees and Angels are based on the same cone shaped spiral. They come in a variety of sizes and colors. For hanging up or for free-standing display. 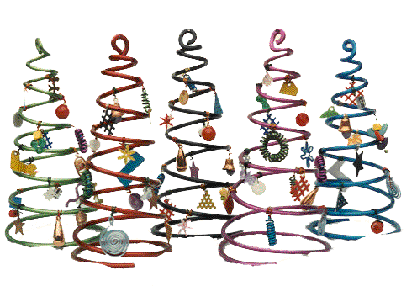 Tiny ornaments dangle from the conical shapes that suggest traditional Christmas trees. Available in three sizes, they can be hung on the tree, or elsewhere, or may be used on table tops and office desks. Colors available: Red, green, lime, purple, deep purple,aqua & gold. 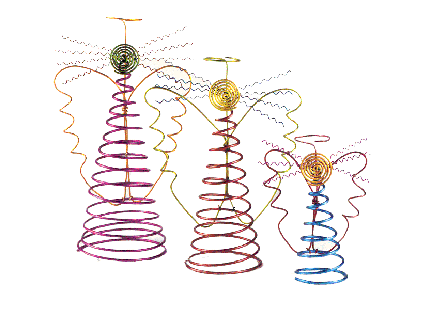 *Thicker wire in large sizes. These abstract beings come with halos, radiant spirals for faces, wings and cascading robes in the shape of a cone. Great as a tree-topper, or on the table or a desk. Colors available include purple, red, aqua, green, lime and gold. *Thicker wire than in large sizes. This angel's robes are decorated with tiny ornaments, just like the Xmas Trees.